Wonderful 10" Rollins on Prestige with a very cool cover. This beautiful little 10" record kicks off in style with some great, up-tempo hard bop. I have to say, this is a truly sublime Rollins effort. And the line-up is very, very good with Rollins on the tenor, Kenny Dorham on the trumpet, Elmo Hope, the superb, perhaps underrated pianist, Percy Heath on the double bass and a guy called Abdullah Buhaina which is of course, unmistakably, Art Blakey on the drums. The cover art for this album is one of the coolest I've seen. With the superb black and white photo of Rollins and the silver text on the front. 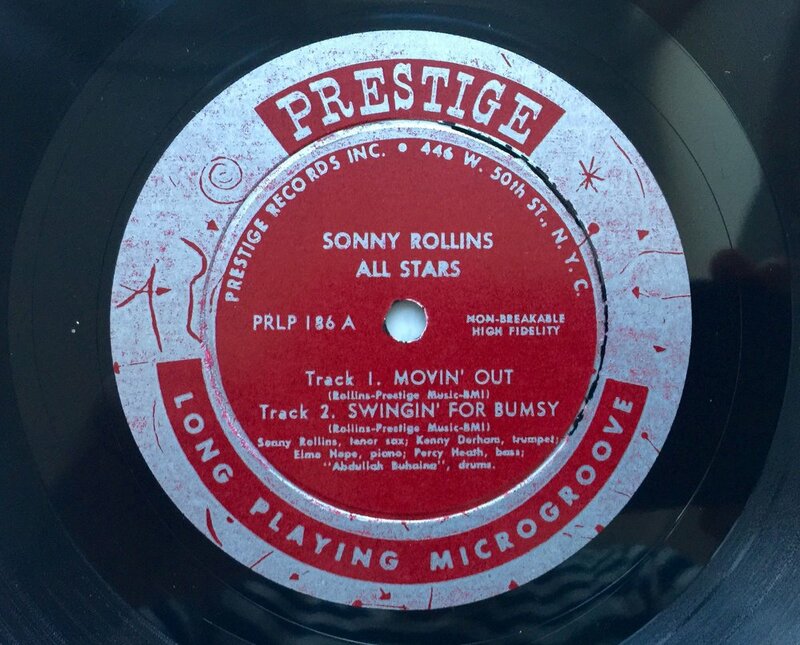 There's another Prestige 10" (PRLP 190) with a black and white front photograph of Rollins which also is very cool. But for me, this is a tad cooler. I'm still looking for the PRLP 190. I do love the 10" format, although I have but a handful of them. I've concentrated on 12" records for the most part but I'm aiming to collect a lot more 10" LP's. They feel truly genuine and they came before a lot of the 12" albums, so they are earlier, older, and that makes them highly desirable to me. This Prestige sounds remarkably nice as these older 10" albums are, from what I've gathered, more difficult to obtain in great shape. Overall, I guess, but especially the Prestige 10" albums. The cover is in superb shape as well. I'm very happy with my copy. The music on this album was later released on a 12" album called "Moving Out" on PRLP 7058. All the tunes are great and you should check them out if you're unfamiliar with them. One of my favorites is a ballad called "Silk N' Satin", it's beautiful. A highly recommended album. Spring has at last arrived here in Stockholm. The sun is shining and the trees on my street is getting greener. I've been saving up for a summer vacation with the family for quite a while. It's been difficult to buy albums during this period. But now we have booked it, the flight and hotel. So, perhaps I will be able to put aside some dough now for some nice jazz albums again. I'm extremely motivated to buy some new stuff and let's see if I can track down some nice pieces soon. In the meantime I will post albums from the collection. 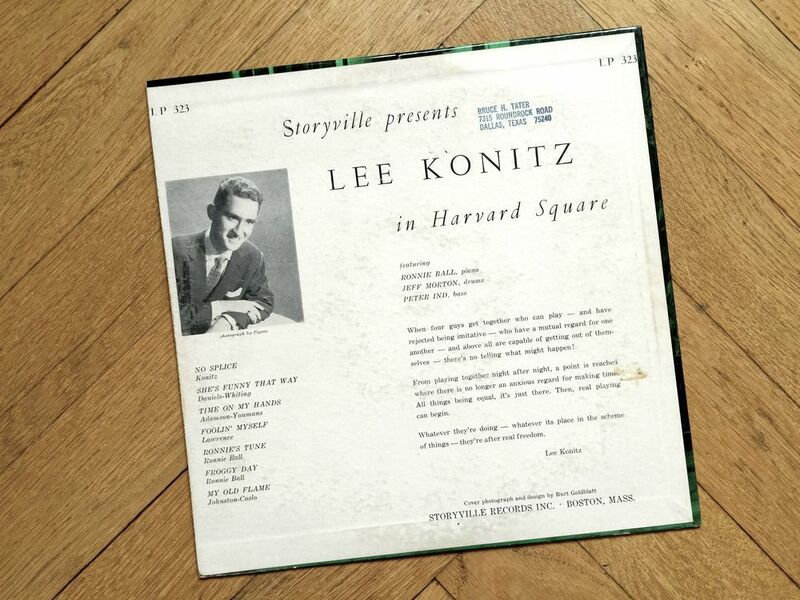 A nice 10" Konitz from 1954. I have a few 10" LP's. I love the format. Feels so genuine to put on an old ten-incher. 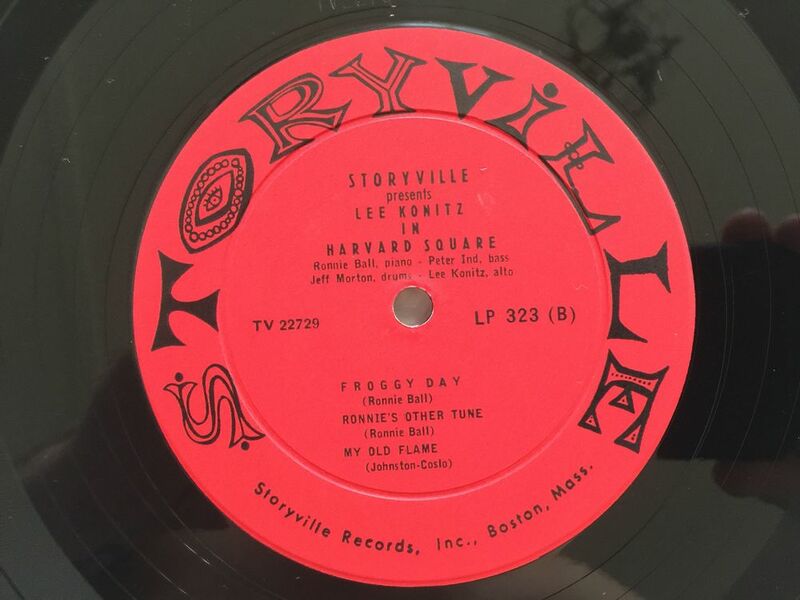 This one is "Lee Konitz in Harvard Square" on Storyville from 1954. A great little gem. I love the image of Konitz without the glasses on the back slick. Superb front cover art as well. It's in quite good nick, some light surface noise and tics and clicks, but fully acceptable and enjoyable. I guess these old Storyville 10" LP's have more or less surface noise even if they are as new. These smaller labels usually are quite unreliable in terms of noise or not, even if the albums are in good condition. And if you can't stand a 1950's LP with some noise you're practicing the wrong hobby, right? It's part of the charm and the old timey feel and soul. God, I love vinyl. The music on this baby is very nice. Mellow and relaxing even in the up-tempo parts. I really dig Konitz playing, it's so flowing and effortless. Very lyrical player. I have not explored Konitz at all really. I have this one and that's it. I really need to look up some more nice stuff by him. I'm very excited to what I might find. The personnel on this are: Lee Konitz on alto, Ronnie Ball on piano, Peter Ind on bass and Jeff Morton on the drums. Favorite tune is, without a doubt, "No Splice". A great number with a superb theme. The other tunes are good too, they feel quite short and to the point. It feels like this album is a great way to get into Lee Konitz. At least to me. I'm ready for more. Quick update on the new arrivals front: I have some really, really nice pieces coming up after the summer. I've secured one wonderful LP and two more are in line after that. High-end stuff. Maybe I will be able to squeeze one in before the summer, we'll see. In the mean time I will put up more LP's from my collection. This beautiful 10" LP is one of my favorite albums. 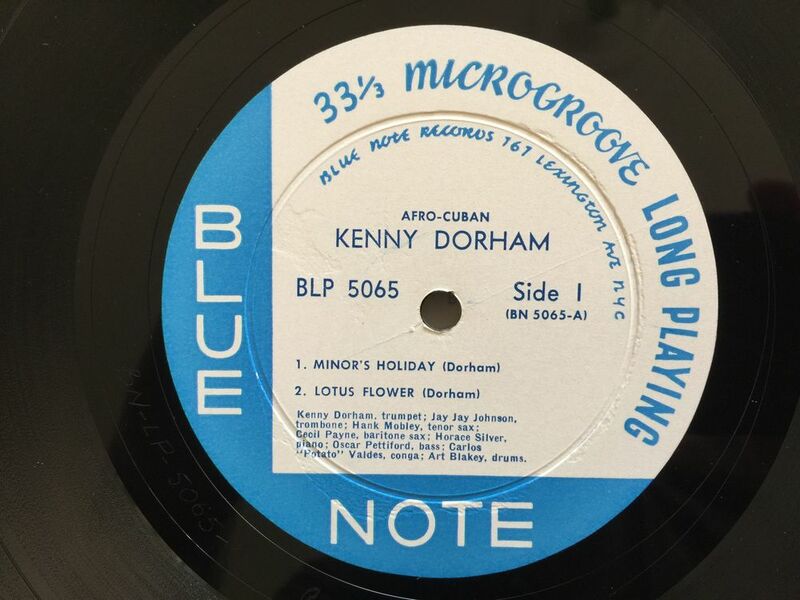 Of course, much for my love of Kenny Dorham, but also, the music on this is something special. It has a very rhythmic feel to it, greatly because the conga playing of Carlos "Potato" Valdes throughout the album, and also the approach to the tunes that are influenced by the music of Cuba. You get a caribbean feeling, a rhythmic, pulsating atmosphere, that makes you wanna just sip a drink in a bar on a beach on some Carribean island. Anyway, it's phenomenal. The tunes are great, and that special, Cuban touch makes this a treat. The copy I have is in great nick and is, of course, a 1st pressing. It's very rare and seldom comes up for sale in any condition. Very happy with my copy and I'm tempted to put it on the turntable quite often. I'm listening to it right now and there's some warmth and sunshine in Stockholm (can you believe it?) right now, so it's quite a nice setting. The personnel on this are, Dorham on trumpet, Jay Jay Johnson on trombone, Hank Mobley on tenor sax, Cecil Payne on baritone sax, Horace Silver on piano, Oscar Pettiford on double bass, Carlos "Potato" Valdes on conga and Art Blakey on drums. In other words a great line up. I think it's cool that Mobley is on here, to hear him in a little different environment, with this Cuban touch going on. By the way, I purchased another great Dorham LP last weekend, which is a truly great one. And rare. I will post that here on the site sooner or later. As always, stay tuned and feel free to comment or contact me about anything. Enjoy your Saturday, spring is here! Oh, how I love Art Pepper. His playing style with that touch of melancholy mixed with lyrical and technical brilliance is truly a joy to behold. I have built a little Art Pepper collection already, with wonderful gems that I enjoy a lot. The only problem with collecting original Pepper LP's is that a lot of his early work is on labels such as this, where maybe the quality of the pressings and the vinyl, or the mix itself isn't quite like, let's say a Blue Note. But I dig the sound nonetheless. I dig collecting these rare, smaller label stuff. This album is quite nice with some very good music. The copy I've got is in good nick too, and I feel the urge to put it on right now. This is Discovery 3023, and there's also a 3019 with Pepper. These two 10" records where later put together in 12" format and became the album "Surf Ride" (MG 12089) released on Savoy. I'd of course rather have these two Discovery LP's as they are the original pressings. I don't have the other one as of yet, but I'm looking. I'm looking at building a small 10" collection with some choice pieces. There's a lot of stuff that was originally released on 10" records, and therefore I need to collect some of those gems in the future. If the music was originally pressed on a 10" LP, then that's what I'll try to get. 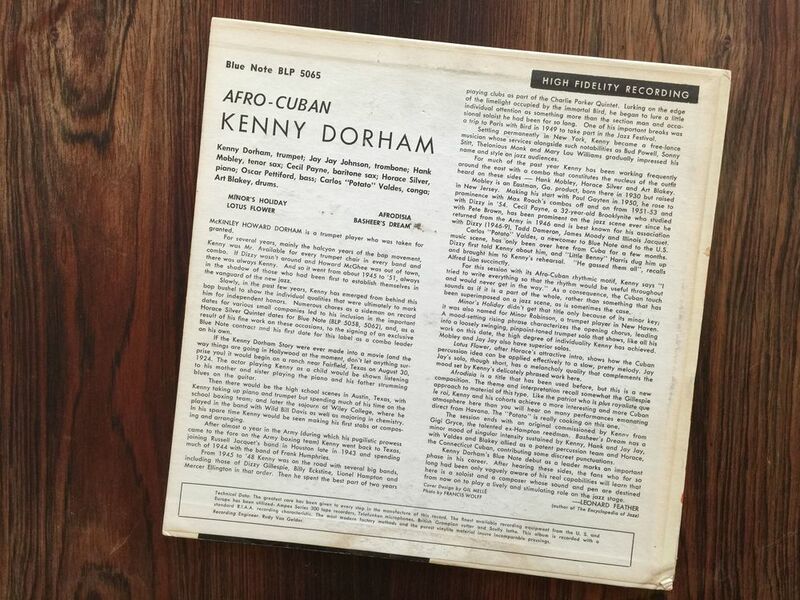 There are some examples, for example "Afro Cuban" by Kenny Dorham where the original tunes were released on a 10" and later, together with some other tunes, released on a 12" Blue Note. The additional tunes on the 12" doesn't quite match together with the stuff on the 10" I think, so in that case, even if the 12" is rare and appealing, I'd rather have the 10". If you're looking for a great piece of early Art Pepper in top form, then this 10" on Discovery could be the one for you. Look it up and enjoy the smooth, cool brand of jazz that Pepper perfected in the 50's. And during that decade I think of driving a Chevy with the top rolled down, in the Californian sun, with some high, faded palm trees swaying a bit in the breeze and the world is colored a hazy, burnt yellow with turqoise spots here and there, like on some old, trashed polaroid image. The cigarette slowly burning between lazy fingers and you just feel the jazz music caressing the soul and mind. More poetry coming up.. stay tuned.